I have had this idea in my head for a few weeks. I had originally planned to use this Aneela Hoey Sherbet Pips fabric for my boys, but it has been sitting a long time with no ideas. However, my god daughter, Olivia, age 4, loves dogs. So much! So I decided to make little Olivia a skirt. When I realized I had the perfect shade of Kona Coral to match the balls in the dog print I knew I wanted a little solid border with an embroidered dog. Nothing like Skirt Week at Crafterhours to get me motivated to finally make it! Some notes about the construction: I made the elastic waist 19" and wanted it pretty full, so I needed 2x waist for the skirt. Since my fabric was 40" wide, I could have used one panel with a back seam, but I did not have a 40" length left of my coral, so I chose to do side seams and use two panels. My main fabric panels were 20" wide by 10" long and my coral hem panels were 20" x 6". I sewed all the side seams together first (main fabric & coral hem). Then I pressed my coral circle band in half along the length, wrong sides together. On one side I pressed 1/2" under with wrong sides facing. I sewed the opposite side along the bottom of the skirt, right sides together. Then I did my embroidery before closing the hem by sewing 1/4" along the top of the coral band, enclosing the raw hem inside. You iron and your pins are your best friends for this task. In case you have never done elastic, the elastic waistband is made by pressing the top down, wrong sides together, 1/4" and then pressing down again another 1". Sew your casing to create a channel, but leave a 1-2" gap in the back. Now thread your elastic through using a large safety pin. Make sure it hasn't twisted at all, sew it securely together to create a loop, tuck it back in and finish sewing the gap you left. You can add a size tag at this point, too. Happy to answer any questions you have. I didn't do a full tutorial, as there are lots out there for this basic skirt construction (Lazy Days is a good one), but I'm happy to help if you get stuck. I hope she likes her new four legged friend! I can't wait to see all the fun entries! I'm trying to decide if I want to attempt one for myself. I mean, minus the dogs! Cute and simple! My daughter would love it, and the dogs! So so cute- love the embroidery! It's ADORABLE!!! I love it! Absolutely precious!!! She's going to love it! I would love to see her face when she gets that sweet gift! Those little embroidered paw prints are great. What a fun skirt. I'm sure she loves it. That skirt is adorable! 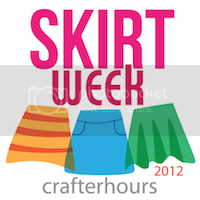 I didn't even know about skirt week - I'll have to check it out as I was just making skirts for my little ones today! Glad I found you on the handstitched link up.